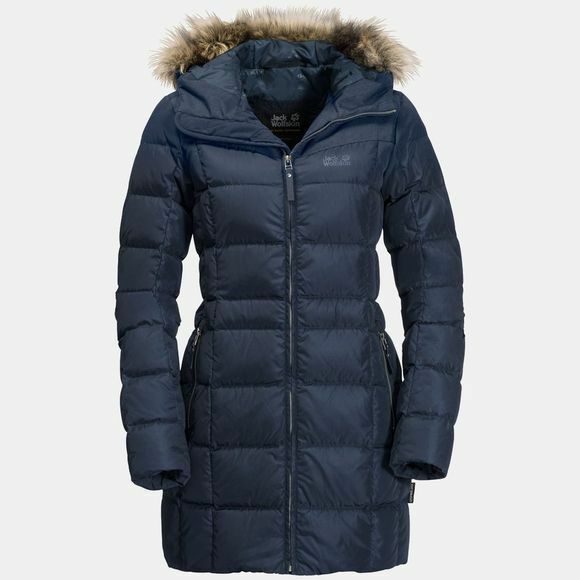 The Womens BaffIn Island Jacket from Jack Wolfskin is stylish enough to cause a minor sensation wherever you wear it. The Windproof outer fabric Increases the Insulation performance, is nice and breathable and has a stylish, shIny fInish. The shoulders and Hood have an extra layer of Microguard synthetic Insulation. The synthetic fibres maIntaIn their Insulation performance even when damp, which is a big advantage In the rain or snow. To make sure you stay warm and cosy when the icy Wind blows, we've added a High collar and a faux fur trim around the Hood that Shields your face from the Wind. The Hood's volume and field of vision can be adjusted to suit the weather conditions. The sleeves are equipped with Internal cuffs for added Comfort and warmth.